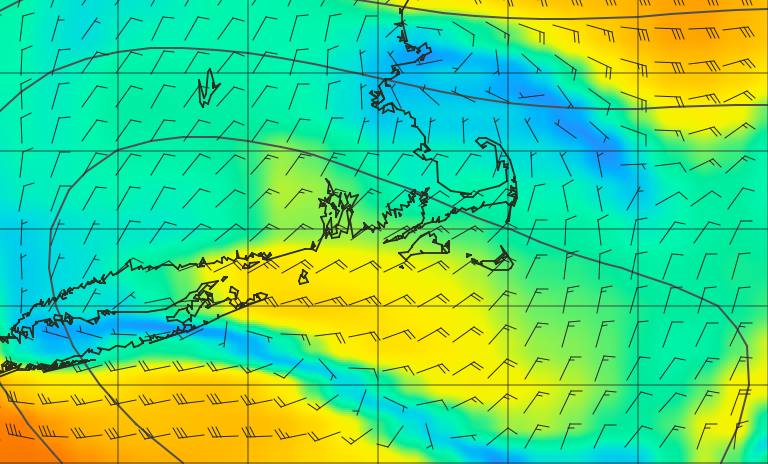 For the race, we will meet a warm front near Cape Cod. The picture gets messy when the low sits right on top of the race area. 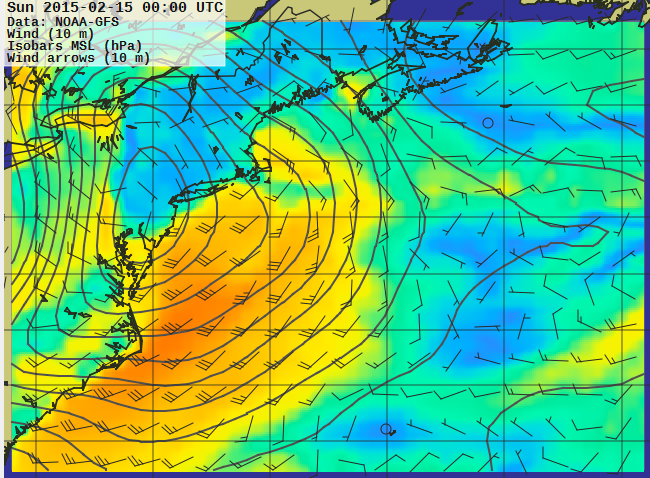 For the finale we are looking at a cold front – polar front combo, no go territory for real boats. 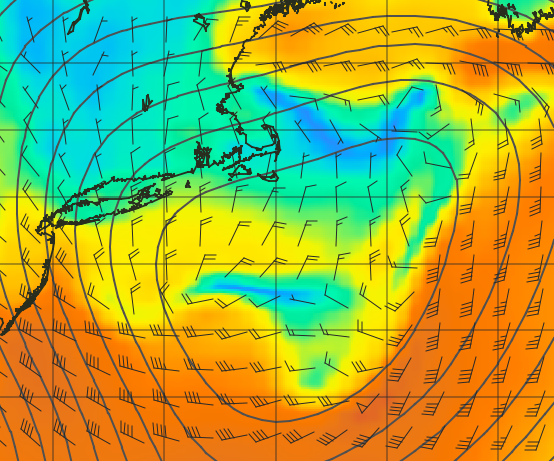 The real forecast warns of hurricane force wind and heavy freezing spray. Peachy. Let’s go virtual sailors! The start is very simple. 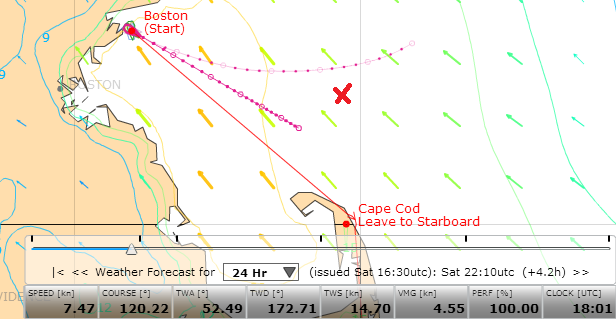 Wind is even over the race area, and a simple VMC135 will have me on the beach near Cape Cod before the front hits. ETA for the beach is 0130z, oh well, I would like to sleep. X shows the projected tack. Exactly what will happen with the front is up in the air, early wx’s show considerable differences. At 2230 I have a closer look. I estimate roughly VMC180 and staying close to the coast from the general flow. But there is a huge shift, from TWD140 at Cape Cod clockwise to TWD40 at Monomoy. 260 degrees in only 6 hours! And the picture looks a bit blurry. Either way, router time. The actual overnight sailing doesn’t go well. Moving the target south at Cape Cod requires tacking along the coast. I don’t get up in time, I had a safe DC but that’s half a mile I won’t get back. Later in the morning I hit land for good. I’ve lost 40min when I wake up. Big mistake. The last third from Monomoy to Newport turns out bland. 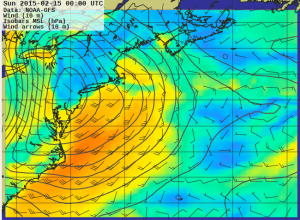 The amusement of sailing in not survivable conditions aside, it’s just rhumb line around the islands. What happened??? I compare the gribs for yesterday’s 1630 and the new 0430 wx. The low pressure has moved much further south than expected, much of the action happens outside the race area. The 12h old wx was off by a good 100nm! In the end, the Americans have used their home field advantage to claim 5 of the top 6 spots. And javakeda wins with a perfect race. Congrats! - Again I’ve confirmed rule #1 – never sleep! - The new wx is great, the middle part turned out complex and fun, even if I was to sleepy to really cover it. - Forecasting frontal movement still is not the exact science one might think, even 12h in advance the gribs were off significantly. - The early forecasts had the fleet crossing 3 distinct fronts, pity that didn’t happen. I can’t wait for the next WRF race. Previous PostNo news from the North frontNext PostBlown Away by Hi-Res Winds!